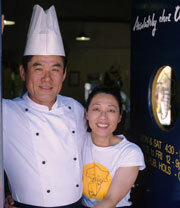 Owner chef Osamu Uchino and his partner Rico have opened ”Absolutely chez Uchino” in Mosman Park since 2005. Their aim is to produce TASTY, AFFORDABLE but still HEALTY FOOD. The food is suited to everyone and ranges from Japanese to European cuisine. They offer casual BYO dine in, Take away, Food to Go, Catering and also Chef’s Hire Service for your special Events. Bookings are essentials for the Dine in, as they are limited tables. They can organize special menu for your dine in, however you need to arrange it by the phone. Lamb chop is coated with Pork ferce, lightly crumbed and pan fried. Their Lamb is from Amelia Park coming from the south west in WA. That is one of the best lamb in Australia. So it is worth try. This Pork dish is regional dish from Nagoya, Japan where Rico comes from. Once Osamu tried it, he loved it. That’s why they put it on the menu. This is one of the most popular dishes for Locals. Above the picture shows 5 kinds of Savouries tartlets. Each flavour is taken it into Delicate consideration by chef Osamu. Please give them notice 24 hours. Osamu & Rico loves sushi. Popular ingredients are fresh Salmon, fresh Tuna, Chicken Teriyaki, Tuna-salad with homemade mayonnaise, Prawns, grilled Eggplant and sun-dried tomato, Avocado & Cucumber. They made to order so it is so Fresh !! This is one of popular take away dish from fridge foods. Just warm it up by the microwave. Shiitake mushrooms give delicate taste. This is the one of Osamu’s unique innovate fusions with European technique and a hint of Japanese touch.